This was the first of a series of four abridged sets on the Columbia label. Unlike the D'Oyly Carte complete sets, which were on 12" discs, these were on 10" discs, and so could be played on less-expensive equipment. Columbia would eventually be bought out by the same corporate entity that owned D'Oyly Carte's label, HMV, but at the time this was made the two were in competition. Indeed, within a few months D'Oyly Carte would make several abidged 10" sets of their own, which was evidently a direct response to the success of the Columbia recordings. The artists here were well-known singers of the time; Joan Cross was apparently as popular then as, say, Kiri Te Kanawa is today. Nellie Walker was the only artist here with any connection to the D'Oyly Carte sets, as she appeared on numerous HMV recordings between 1919 and 1931. Several of the sides on this set were recorded to piano accompaniment only, but all the remaining Columbia sets would have orchestral support throughout. The musicians listed above (Goosens, Draper, Brain), were not the entire orchestra, but merely three of their number whose names would have been particularly well-known. The conductor listed on the record labels was Joseph Batten, but according to Francis, it is in fact Prentice conducting. I confess to a wholesome dislike of the word "potted," as applied to music, and I never use it in that connection. The dictionary gives it as something "Preserved in a pot or a cask"; but you cannot preserve music, properly speaking, in either of those vessels. How the French came originally to apply the term "potpourri" to a heterogeneous collection of tunes from an opera I am not altogether sure. In reality it is not much more appropriate than the English word, but its use has become hallowed by time, and the Dictionnaire National of Bescherelle furnishes as among its meanings either a "Morecau de musique sur une suite d'airs differénts et connus," or "Chanson dont les couplets sont sur differénts airs." Here the actual meaning of the word pourri (i.e., rotten) is obviously not implied at all, potpourri in its literal sense being the term employed for a "ragoût or stew of different kinds of meat, vegetables, etc., seasoned and cooked together, and served at table in the pot in which it was cooked." Anyhow, whether referred to as food or music, this is something wholly different from what we describe in English as a "potted article," whether purchased at Burgess's "fish-sauce shop," or at Jackson's in Piccadilly. Now the Columbia, "Portfolio" of 16 selections from The Mikado, which has called forth these prefatory remarks, is something infinitely more important and extended than a potpourri, without being a reproduction of the complete opera like the usual Album. It lies, in fact, rather more than half-way between the two, and, from the economical standpoint, will probably be welcomed as serving pretty well the same purpose as the more expensive product. It is effected in a series of six 10-inch records, numbered DB321-6, sung by the Columbia Light Opera Company and conducted by Mr. Joseph Batten. The following is the cast: The Mikado and Pooh Bah, Robert Carr; Nanki-Poo, Dan Jones; Ko-Ko, Appleton Moore; Pish Tush, Randell Jackson; Yum-Yum, Alice Lilley; Pitti Sing, Joan Cross; Peep Bo and Katisha, Nellie Walker. I have heard too many casts of this most popular of all the Savoy operas to dare allow myself the indulgence of comparisons; they would carry me too far. Neither are they really called for in the present instance. Memory and imagination combined can very well serve to supply whatever is missing — even what a note in the accompanying book of words describes as "Gilbert's almost immortal wit and satire, heightened by the attractive Japanese setting." The Savoy fan of to-day does not look for the spirit of an original that he never knew and that can never be recaptured. But he can at last sit back and listen with pleasure to the liberal allowance which he will glean from this series of excerpts, representing as it does the absolute pick of Sullivan's ever-fresh, ever-green, ever-fascinating melodies. They are melodies so magical in their exhilarating charm that they even have the power to defy (where the gramophone is concerned) any lapses from the high level of vocal intelligence and refinement of phrasing which the composer foresaw when writing them and insisted upon in person when rehearsing them. That was just five-and-forty years ago, last March. From the second act we have Yum-Yum's song, neatly rendered by Miss Lilley, with, on the same disc, the exquisite madrigal, Brightly dawns our wedding day, ending merrily "in tears," as tradition rightly demands. The latter, very smoothly sung, is succeeded by the patter trio, Here's a how-d'ye-do! and, of course, the Mikado's popular song with chorus about the "object all sublime" that is to "let the punishment fit the crime." The rest of the familiar gems follow in due order, all excellently recorded, and worthily rounding off a selection that gives full prominence to the wealth of ensemble contained in Sullivan's sparkling score. ca. 1940 Columbia (Aust.) 78rpm (10") DO 302/7 Side couplings most likely manual. 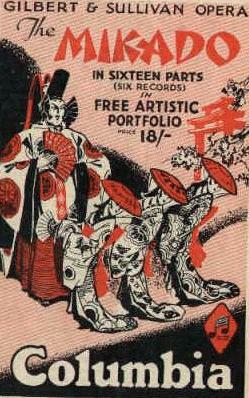 Robert Morrison found this set listed in a 1940 theatrical programme. The date of issue could have been earlier. "If you want to know who we are"
"As someday it may happen"
"Were you not to Ko-Ko plighted"
"For he's gone and married Yum-Yum"
Sides 4, 6 and 10 were recorded to piano accompaniment. On side 8, Appleton Moore sings Pish-Tush (i.e., the bass line in the Madrigal). As James Tappin observed, he uses "a somewhat less 'silly' accent than he uses for Ko-Ko." On side 12, the piano joined the orchestra. 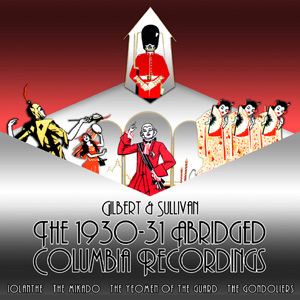 The matrix numbers for the Columbia Mikado, Iolanthe and Yeomen were pre-assigned in the issue sequence of the selections; hence, unlike many of the HMV 78rpm sets, one cannot determine the recording order by sorting the matrix numbers. From the Recording Date column, however, we can see that the company recorded three sides per day on each of four days. This observation certainly puts the "take numbers" (a "-1" or "-2" after the base matrix number) in question. If, as these numbers suggest, the first take was published for all but two of the sides, it should have been possible to record more than three sides per session. The Mikado is the only one of the four Columbia sets to use "a" and "b" to label multiple selections on the same side. On the other three Columbia sets, the selections are numbered starting at 1, and the numbering continues on consecutive sides. Mikado was also the only Columbia set to number the sides in all known pressings. For the other sets, the side numbers seem to have been supplied for U. S. pressings, but omitted from U. K. pressings.